Uniquely different and full of earthy beauty, this two-link bracelet is surprisingly easy to create! 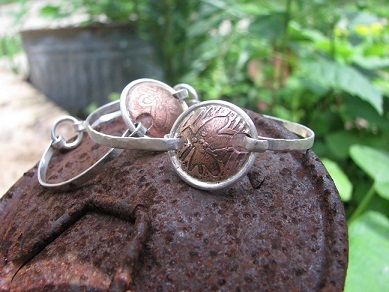 Draw or stamp a design onto a copper disc allowing it to etch while you form a two-link sterling silver bracelet band. Doming techniques and soldering complete your etched disc and hand-formed jump rings connect everything together. Materials included. Ages 18 and up or 14-17 with adult.